Our next walk will start at Baconsthorpe Castle and we will use field paths, tracks and lanes towards Plumstead Green and Hempstead before returning to the castle. Primroses and violets on the way! Meet at the village sign at 11.30am as usual to follow or car share or in the English Heritage car park at the castle at 11.45. I walked it yesterday and I am pleased to say there was very little mud! Our next walk starts from Upper Sheringham where we will walk through the village into Sheringham Park then down to the coast via the Gazebo , into Sheringham and back up to the the cars via the Holt Road past the High School. Forecast looks good - shorts? Meet at the village sign at 11.30 to car share or follow as usual or outside the church in Upper Sheringham at 11.40. Our first walk of 2019 in this coming Sunday when we will be walking a circuit at Felbrigg Hall starting from the dog-walkers car park at Sexton's Lodge. (Car parking is free). Meet at the village sign in W B as usual at 11.30 to car share or follow - or meet at the Sexton's Lodge car park at 11.45. Directions to the car park are as follows: take the A148 towards Cromer, then passing Roman Camp garage on your right take the next right hand turning, Byeway to Suffield. This is rather narrow and windy but visibility is good. Turn left through the gates at the first large house on your left and the entrance to the car park is on the right before the cattle grid. I hope Sunday's weather will be a little better than today's! We have planned a walk around the Bayfield Estate. Meet at the village sign as usual at 11.30 to car share or follow or we will meet you in the car park by Natural Surroundings - which is up the main drive to the estate, turn left just beyond the cafe/visitor centre where there is parking to the left of the drive. 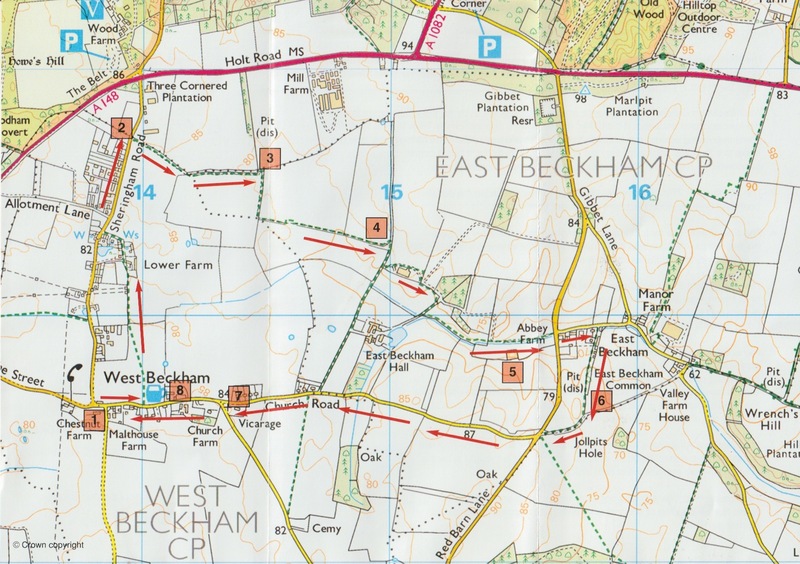 I have just done a recce for Sunday's walk - hopefully it won't be quite so sticky out - should be sunny intervals with a top temperature of 18C. A level woodland walk again - this time through the woods around Roman Camp. We will go round the Canadas, then out to the viewpoint before walking back on the NT trail to the car park. Meet at the village sign at 11.30 to share cars or follow if you are not certain of the way. Otherwise meet in the Roman Camp car park ( NT) at 11.45. There is parking off Sandy Lane opposite the entrance to the Roman Camp car park if you don't want to pay and then you can walk along the track to join us. This is an early warning for the 22nd as we are away tomorrow for six days walking a section of Hadrian's Wall - but will be back for the village walk. We will start from the Pretty Corner Car Park so meet at the village sign at 11.30 as usual to car share or to follow, then meeting at Pretty Corner for 11.45. Walking Sunday is here again - where does the time go! We thought we would walk close to home again this time through Sheringham Park and paying a visit to Weybourne Station on the way. Meet at the village sign as usual at 11.30 am to car share or follow or in the car park at Woodlands (formerly Pinewood) gym at 11.45. Walking Sunday is here again. We are planning to walk around Mannington Hall this Sunday - and, hopefully, find some orchids in the meadow. Meet at the village sign at 11.30am as usual for car share or to follow - or 11.50am at the Mannington Hall car park if you know the way. Here's hoping for a stroll in the sunshine on Sunday. We are planning a walk from Bodham through the allotments to Baconsthorpe Castle and returning via Red Hart Lane. 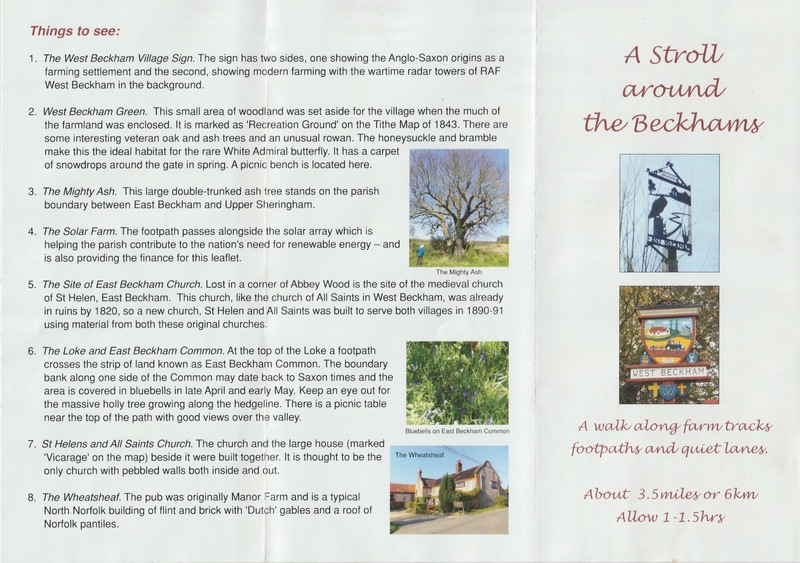 Meet at the village sign at 11.30am or park outside the Bodham and Beckham Village Hall and meet for 11.35. Due to the wind forecast for tomorrow,we are going to walk in the woods for a bit of shelter - meet as arranged at the West Beckham sign at 11.30 and we can then do a car share to the start of the walk. The walk will be between Cley and Salthouse. We will walk along the Attenborough Trail from the Norfolk Wildlife Centre into Salthouse with a loop round the church then return via the higher footpath following the old cliff line. Meet at the village sign as usual at 11.30am or at the lower car park of the Wildlife Centre at 11.50am. An opportunity for coffee etc at the end of the walk! Walking Sunday is here again! This month we plan to walk on Kelling Heath, dropping down towards the coast then back to the top of the Cromer Ridge - so there will be some hills! Meet at the village sign at 11.30 am as usual or at the car park on Holgate Hill - on the left hand side beyond Holt Garden Centre ( Emcy, as was) if approaching from the Holt direction or on the right before the garden centre if coming from Weybourne. Sunday, December 31st As the fourth Sunday in December is Christmas Eve we discussed moving December's month's walk to another date. The consensus seemed to go for the following Sunday - New Years Eve, 31st. Looking forward to seeing you then if you can make it. Sunday 22nd October 2017.This will be walking around Hunworth. About 3 miles long, walking on public and permissive paths through fields and on the Stody Estate. We will visit the River Glaven and cross the course of the M&GN railway line in the valley. The weather looks mixed so bring appropriate clothing.